St. Helen’s Church represents 1,300 years of Christian presence on Lundy. It is a notable feature not only of the landscape of the island but also of the seascape of the surrounding Bristol Channel. Being only 12 miles from the North Devon coast, St Helen’s Church is one of the few structures that can be seen from the mainland. At Circa 400 feet above sea level, the building stands as a monument to those who built the church on the granite skyline of Lundy. Whilst it is externally quite austere, it has a truly inspiring interior. It was designed by the notable Gothic revivalist architect John Norton, most famous for his work at Tyntesfield. Many of the natural materials used in the original construction are amply able to withstand the harshest of environments in their own right, but the manner in which they have been fashioned together less so. The traditional methods of construction used whilst adequate for the majority of the UK are tested to the limit on this island. As there is nothing between Lundy and the eastern seaboard of the USA, the church is exposed to the full force of 3,000 nautical miles of Atlantic Ocean. The church is positioned so that the south west corner of the building cuts through the advancing storms, but inevitably some damage is ultimately sustained. Parts of the church have had a new roof at least three times throughout its life and the storms earlier this year have opened up more holes in the roof so that it is now in need of complete replacement. Urgent works of repointing have also been completed to prevent the wind driven rain from entering the building through the granite walls. The challenge we now face is how we manage to detail the repairs and improvement required to provide a sustainable facility for future generations. Our dedicated design team have been working very hard to develop solutions that will withstand the harsh environment without compromising on the conservation and restoration aspects of the building. Volunteers are currently assisting with essential works of repair until the project can start in full. The logistics involved are considerable – just how do you get enough good quality replacement slates all the way across the bay and up the cliff path to the top of the island? The answer is simple – the same way that our predecessors did when they had the vision to build the church in 1895, if anything it should be a lot easier for us. With your help St. Helen’s will be expertly restored – we plan to completely recover the roofs, repoint the walls and relay the floors – and it will become an outstanding and much needed facility for Lundy Island, which will enhance all visitors experience of this wonderful location. If work isn’t started soon to restore this iconic and historic building, it simply won’t be possible to rescue it! Of course all of this effort will take time and money, but with the increasing support that we are realising this challenge is becoming a reality. You too could help by committing to a regular contribution towards the project, a one off donation or simply by sponsoring a slate. Full details are available by clicking here. An educational centre – to help visitors learn more about the island’s fascinating history and nationally important wildlife. Besides the essential repair work, we will install new facilities within the church building to support our education, research and work to aid our understanding of Lundy. On entering there will be a dedicated space to house an exhibition. The remainder of the nave will be a flexible space which will be used as a base and wet weather classroom for visiting schools and colleges, as a lecture hall for educational groups and specialist societies as well as seating for larger church services. 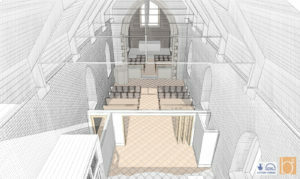 The chancel will be retained for worship as well as being open to visitors. 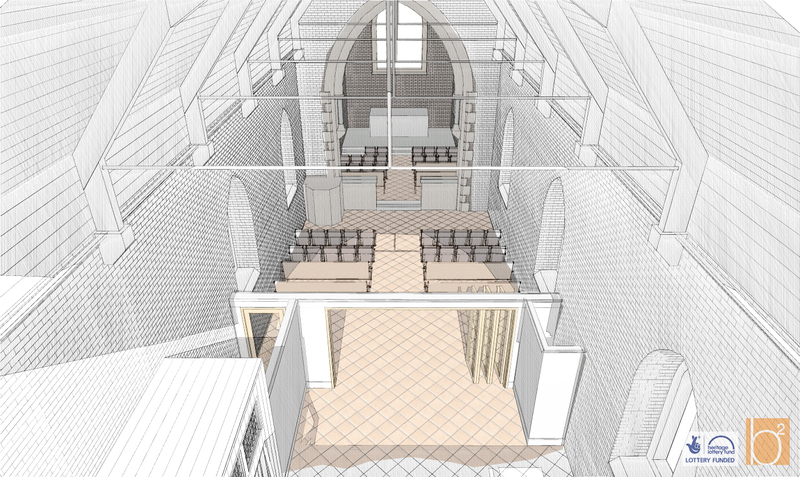 The vestry will house research facilities and accommodation for visiting students and clergy. As it has for the last 120 years, St Helen’s will continue as a place of worship and a place where people can celebrate important events in their lives such as baptisms and marriages.